With nearly 50 people in attendance, meteorologist Kevin Kacan of the National Weather Service instructed first responders, amateur radio operators and weather enthusiasts alike on the methods and safety of severe weather spotting and reporting. 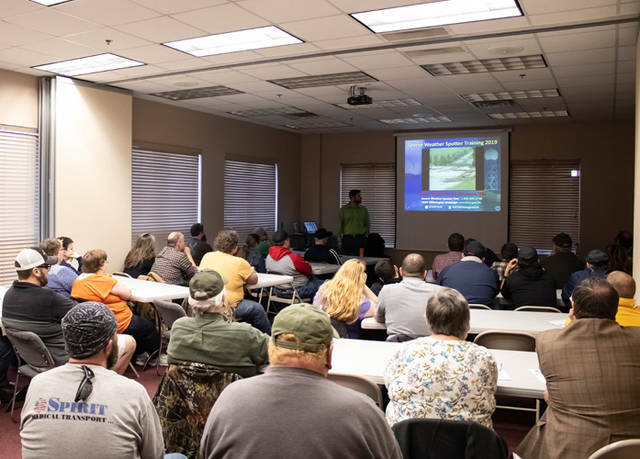 GREENVILLE – The Darke County Emergency Management Agency in cooperation with the National Weather Service of Wilmington hosted its annual severe weather spotter training Tuesday evening at the Greenville Township Emergency Services Building. With nearly 50 people in attendance, from Darke and surrounding counties, meteorologist Kevin Kacan of the National Weather Service instructed first responders, amateur radio operators and weather enthusiasts alike on the methods and safety of severe weather spotting and reporting. Those in attendance were instructed on the types of severe weather including thunderstorms, straight-line winds, hail events, flooding and tornadoes among all others. With personal safety being of No. 1 importance, students were reminded of the value of their own lives during these times. Phrases such as “when thunder roars go indoors” and “turn around don’t drown” were emphasized. This entry was tagged Darke County Emergency Management Agency, EMA, Emergency Management Agency, Flood, Flooding, Floods, Greenville Township, Greenville Township Emergency Services, Greenville Township Emergency Services Building, Hail, Homeland Security, Homeland Security and Emergency Management, meteorologist, National Weather Service, Severe weather, storm, Storms, Thunderstorm, Thunderstorms, Tornado, Tornadoes, weather, Wind. Bookmark the permalink.